Good morning, and I’m back on the blog to showcase one of my favorite Snickerdoodle Designs’ collections, Lady Bug, Lady Bug. 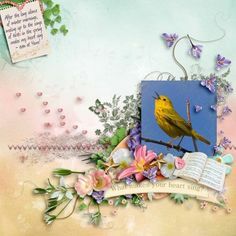 While this collection works perfectly for all your summer layouts, I think you will find it extremely versatile, as evidenced by the layouts I have chosen for today. The collection is packed with many embellishments, and the palette is varied. I’m showing you just the kit here but click on the photo or the link below to view the entire collection. Right now you can save 30% on the Kit and Extra Packs, or 59% on the entire Collection! Let’s take a look at the layouts I found. 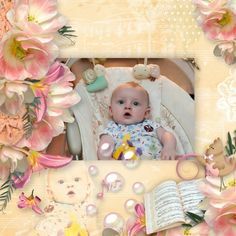 This layout by Deanna perfectly showcases the sweet photo of her Granddaughter. I love the stacked papers and the way she creates a frame by using both the doily and the floral wreath behind the photo. The title balances the framed photo, and the bow and clustering are lovely added touches. Here’s another adorable photo this time featured in a layout by Pam R. Her framing using the chalkboard tag offset by the window frame is a great design touch. Did you notice the little bit of lace peeking out? One of her clusters is duplicated and flipped, which is a wonderful time saving technique. 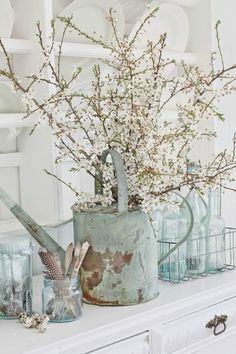 The large cluster down the left hand side is beautifully shadowed, and the paint and sparkles as well as the doily and chicken wire add visual interest to the background. Yobeth chose a different color scheme for her layout, primarily red and green. I really like the way the chevrons draw the eye to the photo. Placing the title atop the photo is another way to focus attention on the subject of the layout. Her clusters are so sweet, and the swirling ribbons emphasize the horizontal flow of her composition. The vertical design of Henriette’s layout is outstanding. I like the way she wrapped the paper with the twine. The scattering of flowers and insects as well as the word art, which she created herself, work together and the result is an amazing white space layout. Here is just one of the layouts I have created with this collection. I chose a palette of black and green demonstrating yet again the versatility of this collection. I kept my design simple and spaced toward the right side of the page to direct the focus to the photos. Note the alpha I used in the title, which is just one of four in the collection. It was quite difficult to choose from the many gorgeous layouts I found using this collection. My picks are designed to show you as much of the collection as possible, and I hope you found these layouts inspiring. Have a great week and happy scrapping!